During this workshop participants will build an instrument based on Arduino. 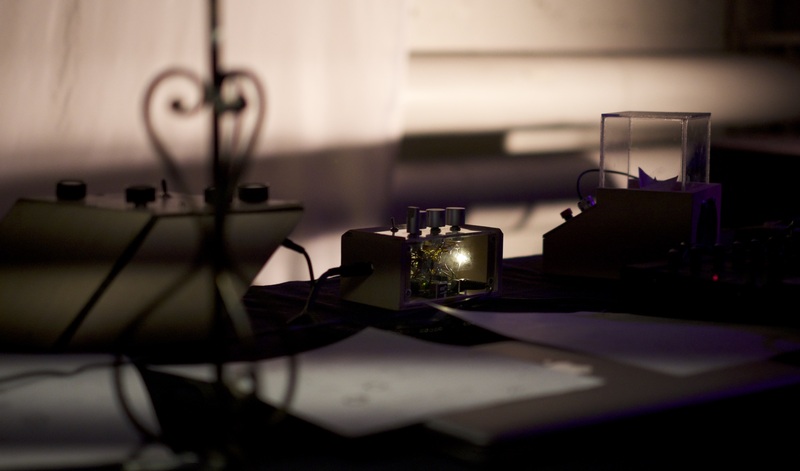 The sound will be generated using Mozzi, which is a sound synthesis software library for Arduino. After designing and building a working prototype, participants will play with incorporating random values in compositions, physical tonal layouts for melodic scores and collaborative performance methods. After everyone has developed a working prototype, participants will perform a roughly composed piece with their instruments on Tuesday 6th at Kallio Stage. On the first day we will consider the design of the interface, assemble and test the electronics. On the second day (Tuesday 6th of March) we program our devices, develop and practice the collective performance. This workshop is part of ÄÄNIAALTO III (5-9.03.2018). Marloes van Son builds systems, installations and instruments. The electromechanical objects that she develops explore natural phenomena and everyday appliances. By repurposing ordinary objects she aims to create unusual, yet familiar experiences. Her recent work focuses on sound compositions, alternative scores and instrument building. During performances Marloes plays her self-built instruments according to precomposed scores, which result in atmospheric soundscapes with melodic elements. Marloes has been organising workshops where participants can explore experimental sound devices by building their own versions. Dialogues with an audience engaged in experimentation are an increasingly important element in her work. Originally from the Netherlands, she currently lives and works in Helsinki (FI). Recent events include: Solo-exhibitions at Galerie AMU (Prague, CZ) and the Tekniikan Museo (Helsinki, FI). Artist residencies at Titanik (Turku, FI) and DordtYart (Dordrecht, NL). Sound-performances at STEIM (Amsterdam, NL), SMC2017 conference (Helsinki, FI), Third Space (Helsinki, FI) and DASH festival (Helsinki, FI). She presented work at Supermarket art fair 2017 (Stockholm, SE), ITGWO festival (Vlieland, NL), and Shiny Toys festival (DE). She graduated in 2017 from the Visual Culture and Contemporary Art programme (ViCCA MA, Aalto University, Helsinki, FI) after completing her BA at the ArtScience Interfaculty (BA, KABK, The Hague, NL). ÄÄNIAALTO is an audiovisual festival in Helsinki showcasing works, installations and performances. In this third edition we aim to gather striking oddities of sound and new media art in forms of performances, workshops, installations, fixed media works and talks. Some of the topics that gravitate around this edition are: robotic instruments, AI vs human control, intersection between biology and sound, and custom instruments for AV performance, but we challenge the potential participants to present us more intriguing ways of producing, using and manipulating sound. DADA ry lähetti ehdotuksen: 22. helmikuuta 2018 23.36. DADA ry on tukenut 250ᵽ tähän ehdotukseen. hyksos on tukenut 106ᵽ tähän ehdotukseen. krrnk on tukenut 15ᵽ tähän ehdotukseen. firstCoffee on tukenut 25ᵽ tähän ehdotukseen. Matti Niinimäki (Matti) on tukenut 156ᵽ tähän ehdotukseen. Agnieszka Pokrywka (agnes_pockels) on tukenut 50ᵽ tähän ehdotukseen.